On April 8, 2011, an explosion occurred at Waikele Self Storage in Waipahu, Hawaii, on the island of Oahu. The facility was leased by Donaldson Enterprises, Inc. (DEI) for storing seized fireworks prior to their disposal. Five DEI employees were killed in the explosion and resulting fire. Just prior to the explosion, DEI employees had entered the storage facility to seek shelter from the rain. A large quantity of explosive components inside the facility ignited while the employees were inside. The employees had been dismantling confiscated fireworks under a federal contract and had allowed the material to accumulate. The ignition source could not be definitively identified, but it is likely that the explosive pyrotechnic powder was ignited from a metal-to-metal spark when employees were moving material around, according to the United States Chemical Safety and Hazard Investigation Board (CSB), the organization that investigated the accident. 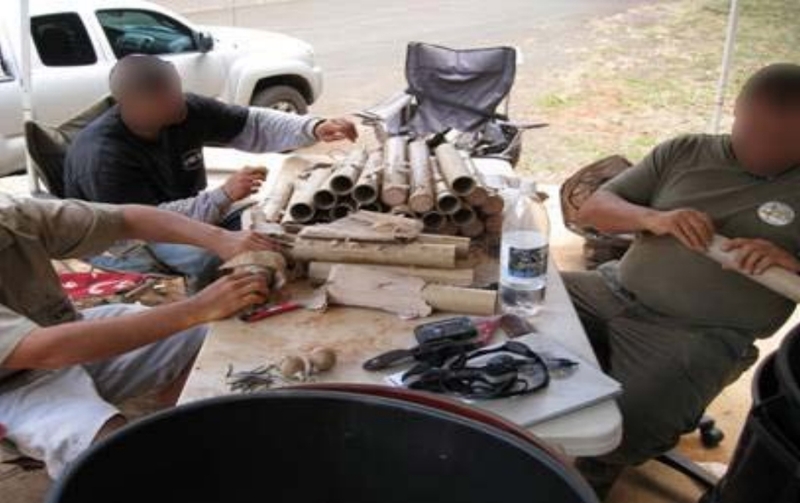 DEI personnel disassembling fireworks at the Waikele facility (Credits: CSB). DEI was a subcontractor to VSE Corporation, authorized to dispose of property seized when shipped through Honolulu. CSB found that DEI was awarded the subcontract because its proposal was lowest in cost and most time-efficient. However, DEI had no prior experience in fireworks disposal, and federal regulations did not require VSE to conduct a safety review before awarding the contract. DEI did develop a methodology to dispose of the material, but its procedures allowed for the accumulation of large quantities of explosive components and therefore exposed personnel to significant risk. According to CSB, “DEI’s Activity Hazard Analysis and procedures failed to identify and control the key explosive hazards involved in this process. DEI personnel also had a lack of fireworks training and experience.” The CSB stated that VSE did not provide sufficient oversight of its subcontractor, and did not use personnel with sufficient technical expertise to perform oversight functions. For example, DEI made modifications to its disposal process, but these changes did not receive adequate analysis or review. The CSB also identified a concern over federal regulation of fireworks disposal. While the US Occupational Health and Safety Administration (OSHA) Process Safety Management regulations apply to fireworks manufacturing, it does not apply to fireworks disposal. The CSB stated that, “Had the standard applied, DEI would have been required to conduct a safety review of the potential hazards involved when it changed its fireworks disposal process.” Of particular concern was that the United States Federal Acquisition Regulation (FAR) covering the federal government’s acquisition of goods and services “does not specifically require a federal contracting officer to consider safety performance measures and qualifications when determining the ‘responsibility’ of a potential government contractor,” according to the CSB. The CSB made a number of recommendations for revising key regulations to cover the disposal of hazardous materials. 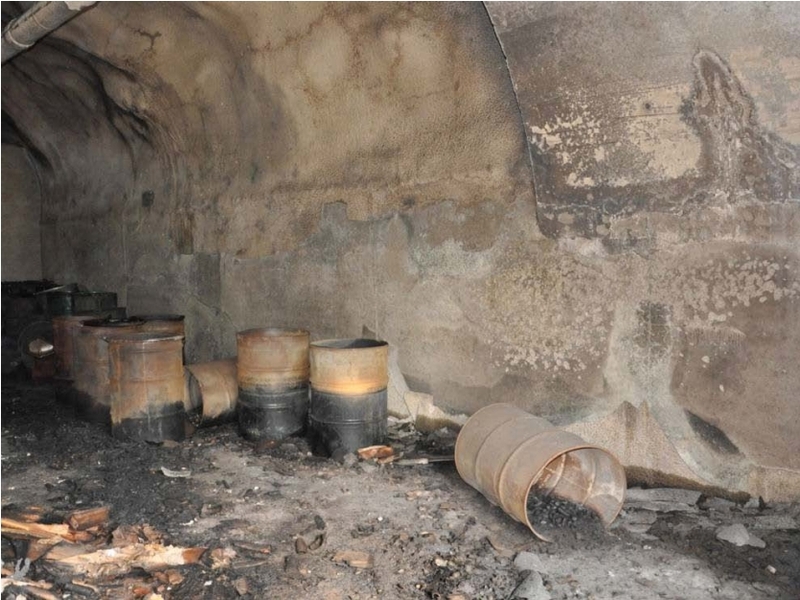 Interior damage to the Waikele facility after the explosion (Credits: CSB). This accident was caused in large part by a failure of the system safety process, which is key for the safety of both space systems and terrestrial applications. A system safety process is the structured implementation of safety engineering and management principles, criteria, and techniques to address safety within the constraints of operational effectiveness, time, and resources throughout all phases of the life cycle of a system. This process identifies and analyzes hazards and risks, then reduces or controls such risks to acceptable levels. An acceptable system safety analysis identifies and assesses the likelihood and consequences of any reasonably foreseeable hazardous event during operation that could result in an accident. This process also assures that risks are effectively communicated to achieve appropriate risk decision making. System safety tools and methodologies are currently used by most organizations building complex space systems. A key tenet of system safety is that safety should be designed in, not simply added on after the fact. The safety effort must be part of the design from the very beginning, and then part of the entire development life cycle to truly be effective. Adding on safety features later in the design or trying to implement a system safety program late in the life cycle is likely to increase costs and is generally less effective than reducing the risk earlier in development. Many organizations define their life cycle to include concept development, preliminary design, final design, fabrication/assembly, test, operations, and decommission. And these organizations often include system safety efforts throughout these life cycle phases. But even with strong safety efforts in these development phases, organizations may still fail to address safety in one of the most critical phases: acquisition. Many critical safety decisions are made during acquisition planning. For example, contract negotiations may result in the elimination of essential safety requirements. As a result, system safety personnel may not have access to critical information needed to evaluate risk during development because this information was not specified in contractual requirements. Or safety testing may have to be reduced later in a program because sufficient funding was not allocated early in the effort. Acquisition planning and contractual efforts typically include decisions on contractor selection, approaches to safety analyses, budgets for safety activities, and other engineering activities. If consideration is not given to safety during acquisition then risks could be significant. Because so many safety decisions are made or constrained during acquisition planning, space safety personnel and system safety practitioners should be included in such planning. As part of this planning, safety personnel should be consulted when making schedule and cost decisions. Organizations should pay particular attention to subcontractor oversight and measures for assuring that the subcontractor can perform its functions safely, and identify early the mechanism for flowing safety requirements down to vendors and subcontractors. Safety personnel also have a responsibility to assure that they are knowledgeable in the acquisition process to better communicate issues and advocate for safety early in the acquisition process. Safety personnel must be prepared to provide estimates to management about the level of effort required for a system safety program to allow decision makers to make informed tradeoffs. Most importantly, space safety personnel should be prepared to teach the benefits of what they do and why safety activities are so important to provide decision makers with the rationale to justify adding safety personnel to the acquisition team. Safety planning must be included in all phases of a project, and as this accident shows, no phase is more important than the acquisition phase. Space safety practitioners should do all they can to ensure that they are part of this critical phase of a project. U.S. Chemical Safety and Hazard Investigation Report, “Investigation Report: Donaldson Enterprises, Inc., Fireworks Disposal Explosion and Fire (5 fatalities, 1 injury), Waikele Self Storage, Waipahu, Hawaii, April 8, 2011,” Report No. 2011-06-I-HI, January 2013. Image caption: Aftermath of the Waikele fireworks explosion (Credits: CSB).